Equine Childrens Watches, AWST, Horse Watches, Gift Watches! 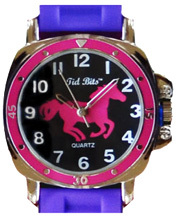 3D Kid's Watch: Elegant horse theme and comfortable band, 3D Kid's Watch is an exciting riding companion for equine fans. A matching playful horse on dial, horses and stars adorn on the strap. Japanese Movement for accurate timekeeping. Measures 1 inch diameter Dial and Adjustable Rubber Strap 5.5 L to 6.75 L inches. Great gift idea! ORDER NOW! 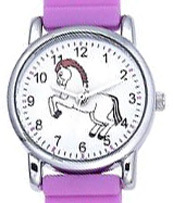 • 3D Kid's Watch Lavender/White Horses: JW73. BUY NOW! 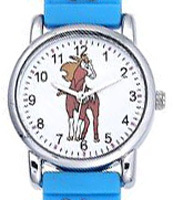 • 3D Kid's Watch Blue/Wild Horses: JW72. BUY NOW! 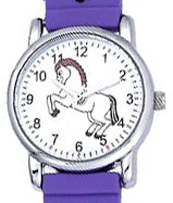 • 3D Kid's Watch Purple/White Horses: JW71. BUY NOW! • Tye Dye Mood Watch: This exciting Mood Watch is enjoyable for all ages. The center icon is a pink galloping horse; the backgrounds transform colors depending on your mood. The tye-dye jelly wrist band is snug and ideal for all day wear. The mood color chart tells when: Black/Excited - Grey/Nervous - Brown/Anxious - Royal Blue/Content - Green/ Serene - Hunter Green/ Relaxed. The Mood Watch has an adjustable band from 6" to 8¼" and presented in a clear gift box. Measures Band width 5/8" wide and Dial 1¼" wide. Great gift idea! ORDER NOW! Olive Kids Wall Clock: It's always fun time with Olive Kids clocks! The colorfully printed face is housed in a plastic case with a protective glass cover. Clock coordinates with Olive Kids bedding and room décor. Silent quartz movement means quiet nap times. Plastic case, glass cover. One AA battery required (not included). Measures 12 X 12 X 1.5 inches. • Olive Kids Wall Clock Dinosaur Land: Dinosaurs have arrived! Olive Kids Dinosaur Land will make kids rumble with per-historic enjoyment. Dinosaurs, including a Brontosaurus and T-Rex inhabit a world filled with volcanoes, primitive trees and dino footprints! Greens and blues are complimented with splashes of bright color for even more excitement. Great gift idea! BUY NOW! 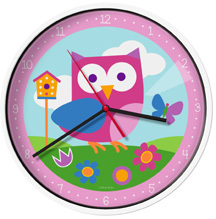 • Olive Kids Wall Clock Birdie: Birdie is a super adorable new girls design. Baby Birds, Owls, Butterflies and Flowers live in this whimsical world. Joyful, vibrant hues are set on a robin's egg blue background. Great gift idea! BUY NOW!